The mutations in AFF2 appeared in 2.5 percent (5 out of 202) boys with an autism spectrum disorder. Mutations in the AFF2 gene, and other genes like it on the X chromosome, may explain why autism spectrum disorders affect four times as many boys as girls. The mutations in AFF2 appeared in 2.5 percent (5 out of 202) boys with an ASD. 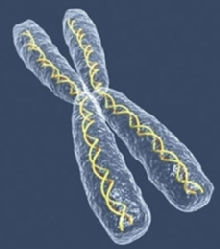 Mutations in X chromosome genes only affect boys, who have one X chromosome. Girls have a second copy of the gene that can compensate. The results were published July 5 in the journal Human Molecular Genetics. “Our data suggest that AFF2 could be one of the major X-linked risk factors for ASD’s,” says senior author Michael Zwick, assistant professor of human genetics at Emory University School of Medicine. The finding bolsters a growing consensus among geneticists that rare variants in many different genes contribute significantly to risk for autism spectrum disorders. The mutations in the AFF2 gene probably do not cause ASDs all by themselves, Zwick says. In some situations, mutations in a single gene are enough by themselves to lead to a neurodevelopmental disorder with autistic features, such as fragile X syndrome or tuberous sclerosis complex. But these types of mutations are thought to account for a small number of ASD cases. Recent large-scale genetic studies of autism spectrum disorders have identified several “rare variants” that sharply increase ASD risk. Scientists believe rare variants could explain up to 15 or 20 percent of ASD cases. However, until now no single variant has been found in more than one percent of ASD cases. Working with Zwick, postdoctoral fellow Kajari Mondal and her colleagues read the sequence of the AFF2 gene in DNA from 202 boys diagnosed with autism spectrum disorders. The patient samples came from the Autism Genetic Resource Exchange and the Simons Simplex Collection. Tests showed that in four cases, the affected boys had inherited the risk-conferring mutations from their mothers. One boy had a “de novo” (not coming from the parents) mutation. Compared with X-linked genes in unaffected people, mutations in AFF2 were five times more abundant in the boys with ASDs. The AFF2 gene had already been identified as responsible for a rare inherited form of intellectual disability with autistic features. This effect is seen when the AFF2 gene is deleted or silenced completely. AFF2 has some similarity to FMR1, the gene responsible for fragile X syndrome. Like FMR1, it can be silenced by a triplet repeat. In these cases, the presence of the triplet repeat (three genetic bases repeated dozens of times) triggers a change in chromosomal structure that prevents the gene from being turned on. In contrast, the mutations Zwick’s team found are more subtle, slightly changing the sequence of the protein AFF2 encodes. Little is known about the precise function of the AFF2 protein. A related gene in fruit flies called lilliputian also appears to regulate the development of neurons. Zwick says one of his laboratory’s projects is to learn more about the function of the AFF2 gene, and to probe how the mutations identified by his team affect the function. His team is also working on gauging the extent to which other genes on the X chromosome contribute to autism risk. The research was supported by the National Institute of Mental Health (MH076439) and the Simons Foundation Autism Research Initiative. Reference: K. Mondal, D. Ramachandran, V.C. Patel, K.R. Hagen, P. Bose, D.J. Cutler and M.E. Zwick. Excess variants in AFF2 detected by massively parallel sequencing of males with autism spectrum disorder. Hum. Mol. Genet. Advance access. (2012).